I’m a white man — so what do I know about diversity? Perhaps not as much as you. But I’ve studied it. Closely. My super-niche Ongig business has one focus: job descriptions. And Ongig has built diversity tools to make your jobs gender-neutral, higher in positive sentiment and more readable. Our software helped 4X the hiring of women and underrepresented minorities for major employers. 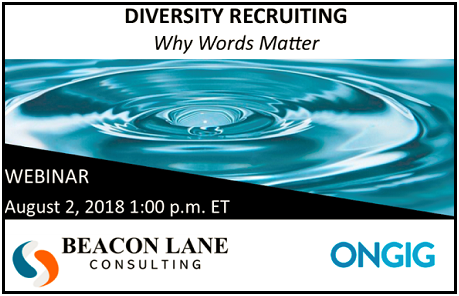 I’ve been invited by Elaine Davidson and the kind folks at Beacon Lane Consulting to give a live webinar called Diversity Recruiting: Why Words Matter. It’ll be in August 2nd at 1pm EST — mark your calendar! Click here to reserve a free spot on the Webinar. Below is a sneak peek on some of what I’ll cover in the webinar. Use a tool like Ongig, Textio or Gender Decoder to gender-neutralize your job descriptions. This will help you attract more women and you’ll lose few if any applications from men. An internal HP Study showed that women applied for a promotion only if they met 100% of the requirements. Men applied if they met just 60% of the requirements. Most job descriptions are written at the 11th-grade reading level or higher. You may think that’s ok because you want high school and college grads or even candidates with advanced degrees. Candidates with Dyslexia (5% to 15% of Americans) — people with dyslexia often struggle with reading words with 3 or more syllables. Candidates with attention difficulty (4.4% of adults have ADHD and the number of children with ADHD may be at the 11% level). To have a truly all-inclusive job description, you want a JD that is going to be attention-getting and easy to read by every candidate. Writing readable job descriptions is no different than writing easy-to-read books, letters or ads. Check out Why I Write my Job Postings at the 8th Grade Reading Level (or Lower!) for more tips on readable job descriptions. Ongig software gives a readability score for every one of your jobs! Some of you put salaries in your job descriptions for certain types of jobs. That’s great. For those of you who don’t, I know that salary is a slippery slope. Heck, you’re not even allowed to ask a candidate what salary they make in many states now. But you can attract a more diverse workforce if you include salaries. Imagine a candidate is a woman or underrepresented minority who feels they are underpaid. If you can empower them with salary information in the JD, they will feel like the playing field is more level. That’s why I recommend that you at least consider including a third-party salary range (such as Glassdoor) in your job descriptions. Ongig’s software automatically attaches Glassdoor’s estimate of salary range for just about every one of your jobs. Ping me if you want to make sure you’re invited to the webinar. It’s free.